Interview: Allie Brosh, Author Of 'Hyperbole And A Half' On her Hyperbole and a Half blog, Allie Brosh writes stories about her life illustrated with a "very precise crudeness." Most are lighthearted — about her dog or her favorite grammatical mistake ("a lot" vs. "alot) — but her most popular posts have also been the most upsetting, about her crippling depression. 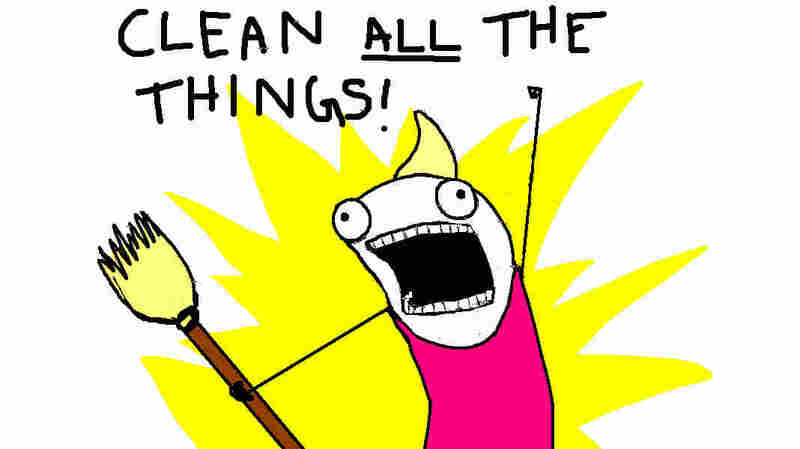 Allie Brosh's humorous, autobiographical blog, Hyperbole and a Half, has a huge following. In 2011, an editor of PC World included it in a list of the funniest sites on the Internet, and this year, Advertising Age included Brosh in its annual list of the year's most influential and creative thinkers and doers. That's pretty amazing considering that, as Brosh describes it, she lives like a recluse in her Bend, Ore., bedroom, where she writes stories about her life and illustrates them with brightly colored, intentionally crude drawings. Brosh talks with Fresh Air's Terry Gross about drawing with a "very precise crudeness," and her struggle to cope with depression. I would describe it as stand-up comedy in book form. I feel like my writing style is sort of the result of me subconsciously trying to replicate the feel of stand-up comedy. I was very frustrated when I first started writing that there wasn't that physicality to it. It was more one-dimensional than stand-up comedy, in which you can rely on tone and facial expressions, body posture. And I wanted to find some way to commit that to the page. Drawing fixed all of those problems. I draw myself with very crude illustrations in a program called Paintbrush. ... I look very funny. I've got these buggy eyes, I've got a sort of tube body and a little triangle ponytail thing on the top of my head. It's a strange sort of animal-like creature. It's me on the inside. That's what I'm like when I view myself. I am this crude absurd little thing, this squiggly little thing on the inside. So it's more of a raw representation of what it feels like to be me. I've drawn pretty much my whole life. It's funny; people often give me a hard time about how crude and simplistic my art style is. I know how to draw realistic things. Really, a lot of time goes into this crudeness. There's a huge difference between drawing the pupil a slightly different size — ... a millimeter to either side can make such a gigantic difference in a facial expression, or shaving a tiny bit off the corner of the line of the mouth. So there's really a lot of work that goes into "perfecting" this crudeness. 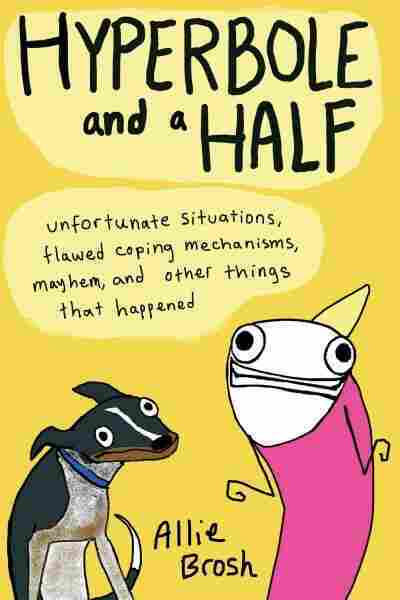 Hyperbole and a Half is Allie Brosh's first book. In it, as on her blog, she draws herself with a tube body and a yellow, triangle ponytail. I've always sort of secretly thought of feelings as a weakness. I think growing up I always wanted to be someone tougher than I am, and so when I first started not having feelings anymore I thought, "I'm finally this person who doesn't react. I'm not sensitive anymore." I enjoyed that for a short time, especially when I hadn't lost my feelings completely, where I just felt like I was emotionally very strong. And then once all of my emotions disappeared, I very quickly realized that emotions are the only thing that provide variation in your life. I think there's a common misconception that depression is about something or depression is sadness or some form of negativity. It can represent a sadness or a self-loathing, as the first half of my depression did. It sort of circled back on itself and made me dislike myself more because I was so sad, and I didn't know why, and I felt like I needed a reason. ... It took me a long time to figure out that something was broken on a fundamental level. There was no reason behind it; it was just the way things were. I remember being very aware in the second part of my depression where I would have to consciously control my facial expressions because I wasn't feeling enough organic emotion to generate them naturally. So when I was listening to a story, say someone telling me a sad story, I was very consciously thinking, "Oh, God, please make a sad enough face. Please, face, do me a solid and be sad enough." I was trying to very consciously control myself so that I remained socially acceptable and didn't alienate anyone. Once I started feeling emotions again and feeling like I'm making progress ... once I felt that I was out of the immediate danger of anything, I started thinking it might be therapeutic to maybe start writing things down and trying to work my way through this mentally. And that led to me eventually writing the [blog] post. And it took months to figure out how to strike the right balance between levity and humor, and treating it with enough respect.